What happens to price if both demand and supply increase at the same time? - FreeEconHelp.com, Learning Economics... Solved! 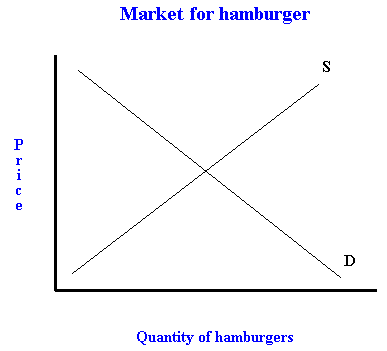 Home equilibrium microeconomics supply and demand What happens to price if both demand and supply increase at the same time? However, before you look at the graph, you must consider how far we are going to shift each of the curves. To give you an example, in the graph below I have shifted the demand curve right (once), but I have shifted the supply curve right three different times. The reason I have done this is to show you that depending on the size (magnitude) of the shift, the resulting equilibrium price can be at three different levels. The result of an increase in BOTH supply and demand is ambiguous. It depends on the magnitude of the shifts. 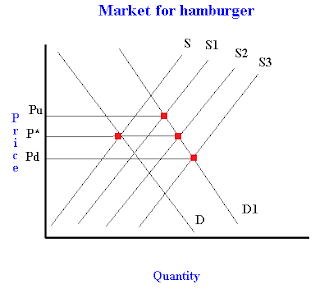 First consider S1 (the smallest shift), this results in an equilibrium price that is greater then the original equilibrium price (Pu>P*). If we shift out supply a little more to S2, then our equilibrium price will not change, it will still be P* (this happens if both supply and demand shift out the same amount). Finally, the S3 curve shows us the largest shift, which results in an equilibrium price lower than the original (Pd<P*). So the answer is "it depends" when both supply and demand increase and you want to know what happens to price. In order to know for sure, we would need to know the magnitudes of both shifts. What we do know is that quantity demanded will go up, and you can confirm this by looking at the three red equilibrium points, each of them are located to the right of the original equilibrium point, and quantity. Why would curves shift out different amounts? One example would be a $1 decrease in the price of inputs vs. a $10 decrease in the price of inputs. You can conclude immediately that the $10 decrease would result in a much larger shift for the supply curve. But keep in mind that this phenomena is not restricted to the supply curve, the demand curve could also shift by different amounts to come up with this ambiguous result. Summary: Remember that it is possible for an answer to changes in market price and quantity to be ambiguous in economics. This ONLY happens if BOTH the supply and demand curves shift at the same time. If only one curve shifts then you can figure out what happens to market price and quantity. For a summary on the results of every possible shift, check out this supply and demand curve shifts cheat sheet. 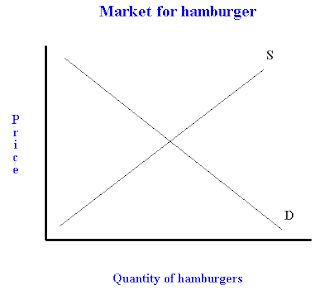 hi there, what if you're given a situation that involves both a shift in demand and supply, but you don't know if the magnitude of one is greater than the other? this question is asking me what would happen to the exchange rate if BOTH imports and exports increase... I know supply and demand both shift outwards, but I don't know how far to shift them considering I could have three different outcomes. Hi there. You can not determine what will happen to the exchange rate if they don't give you the magnitude of change in the imports and exports. Just like in the example above, if the question doesn't mention the amount of the change, you should indicate the three possible outcomes. If supply increases more than the demand, the price will go down. If the increase in demand is higher than the increase in supply, the price will go up. If demand and supply increase at the same amount, price will remain stable. Though, in all three outcomes the quantity will increase. You have provided an nice article. I hope this will be useful for many people and i am waiting for your next post keep on updating these kinds of knowledgeable things.